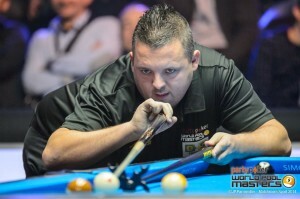 US NO.1 SHANE VAN BOENING survived a nerve-jangling half an hour at the hands of young Aussie James Georgiadis as he edged his way through to the last eight of the 2014 PartyPoker World Pool Masters at the Portland Centre, Nottingham, England. 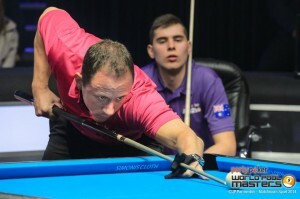 Van Boening, who returns to the UK in two weeks for his eighth Mosconi Cup appearance, looked to be in the driving seat as he free-wheeled through the racks in the winner breaks format to reach the hill at 7-1. However, facing a seemingly impossible situation, Georgiadis loosened up and began to claw the racks back with some excellent shot-making and tight safety play. Van Boening, by contrast, looked uncomfortable as he started to miss balls. In the end though, Georgiadis was up against it in the 14th game and a speculative bank on the 3ball left the table open for Van Boening to clinch the victory. 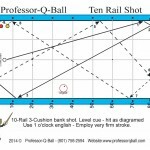 Van Boening said, “I got the momentum going at the beginning but he came back to 7-6 and at that point I had to think about when I have been playing well, like when I won the US Open. I tried to envision that place, because you want to think about something positive and not anything else. You have to try not to worry about your opponent. eorgiadis added, “It was a crazy match, up and down. I found it hard early, especially when he was getting the rolls and breaking well. The start is the key and he got to 7-1 up, which makes it difficult to come back from. In the opening match, 2012 Masters champion Karol Skowerski played well in defeating Chinese youngster Wang Can by an 8-5 score line. He now faces Daniele Corrieri in the first of the quarter-finals. “I am very happy to get through; I was concentrated and focused from the start because I knew it was a dangerous match,” said the Polish star. Classy cueist Chris Melling took a break from the World Snooker Tour and looked as good as ever in defeating No.3 seed Dennis Orcollo by 8-6. Commented Melling, “The only time I have played pool in the last six months was the World Cup, because I am concentrating on snooker now. Any win against somebody as good as Orcollo, whether it is 8-0 or 8-7 and I know I have played well. “My plan was to hit the break differently. I have been watching quite a few breaks and to get the consistency you have to do something different. Dennis started to get the consistency from 6-2 down, and I didn’t have a shot until 6-6. You have to sit there and stay calm, keep confident and wait for the chance,” he added. Play continues on Saturday evening. The 2014 PARTYPOKER World Pool Masters is sponsored by PartyPoker.com, one of the world’s leading online poker sites. 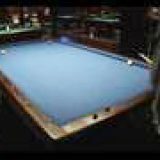 The Official Table is by Diamond Billiards; Cloth is supplied by Iwan Simonis; the Official Balls are Super Aramith and Predator is the Official Cue, Chalk and Rest.